There are only a few documents needed to travel to China, but taking a few additional documents might be invaluable if you have an emergency. To enjoy your China vacation, or make sure you have everything in place for a successful business trip, make sure you have necessary documents and preparations prior to traveling. The Chinese visa proves that the Chinese authorities have given you permission to enter and travel through China. The regulations about travel documents can change at any time, so be sure to check the Chinese embassy website for the most current information. A passport is issued by the country in which the traveler has citizenship. In the United States, a passport is issued for ten years. The passport can be renewed. Visitors to mainland China will be asked to show a passport that is valid for at least six months. So, if your passport expires soon, you might want to go ahead and get it renewed. Do You Need a Chinese Visa? You will need to complete a few forms to apply for your passport and visa. Be sure to allow enough time for the applications to be processed. Don't wait until the last minute. And remember that it usually takes longer to get your application approved in the months right before heavy travel times. Citizens can apply for a passport by completing a passport application form that is available at post offices and most libraries. Send your completed form and a check to the address on the application form. It might take up to six weeks to receive your passport, so be sure to allow enough time. Visa applications are available from Chinese embassies and Consulate-Generals in Washington DC, New York City, Chicago, Houston, Los Angeles and San Francisco. You will need to submit a completed application form, your valid [Get a New US Passport|passport] and two copies of a recent a 2-inch, full-face, bareheaded black and white or color photo. It usually only takes five to seven business days to receive your passport with the Chinese visa stamp. If you don't live close to an embassy or Consulate-General, you can have your travel agency or a visa agency submit your application, passport and photos for you. If you are planning to be part of a China travel tour company, your touring company may handle the visa application process for you. The passport and Chinese visa are necessary to enter the country. Several other documents can also be useful, even though they are not required. You can usually use your United States driver's license to rent a car. An international driving permit (IDP) may speed up the rental process, but it is not required. You can obtain more information about IDPs online and apply for an IDP online. Be up-to-date on your vaccinations (like a rabies shot) before you leave on your trip. Get a yellow fever vaccination if you will be entering China after having traveled to a country that has yellow fever. Ask your health care provider for an international health certificate after you have received your vaccinations. This will be helpful to show at Chinese customs to prove that you have received the necessary vaccinations. Carry a complete medical record with you including your blood type, allergies, medications, vaccination record and contact information for your doctor and your insurance company. Make three copies of your documents. Keep one set with you, one set in your luggage and give one set to a friend or family member that you can contact quickly. Email yourself a set of your documents that you can retrieve online if you ever need the documents. 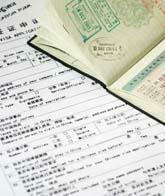 The requirements for documents needed to travel to China can change quickly. Be sure to check the Chinese embassy website as well the United States State Department website for the most current information on documents needed to travel to China.